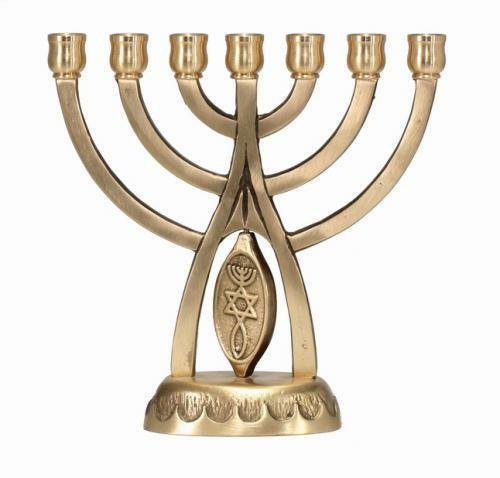 The Menorah of Unity. Made of high quality Brass. 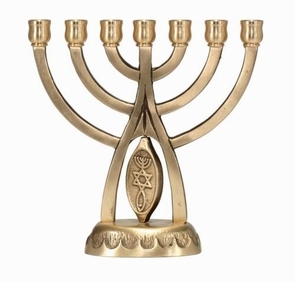 Seven Branch Menorah. 19cm of Height. Now is the time to live the unity of the Scriptures. The time has arrived for both Gentiles and Jews. Feel the arms of Messiah Yeshua and touch the Heart of God surrounding you. Welcome the Messiah by remembering Him. This product is part of a collection of Messianic vessels, manufactured by good people in Israel, made in the Bible Land and shipped from the Holy Land of Israel. This unique collection is decorated with the Messianic Seal of Jerusalem, a symbol that unites all "Messianic Jews", "Jewish Christians" or "Christian Jews" worldwide. The symbol gathers the Jewish Menorah together with a fish - a modern depictive representation of Christian faith and the community of Jesus followers. The Menorah and the Fish create a Star of David (Magen David – The Shield of King David) at the intersection.